Samsung today announced what it is calling the first multi-terabyte consumer solid-state drive (SSD), which will offer 2TB of capacity in a 2.5-in. form factor for laptops and desktops. The new 850 Pro (Amazon price for 250GB model at press time: $120.99) and 850 EVO SSDs double the maximum capacity of their predecessors. As with the previous 840 Pro and EVO models, Samsung used its 3D V-NAND technology, which stacks 32 layers of NAND atop one another in a microscopic skyscraper that offers vastly greater flash memory density. Additionally, the drives take advantage of multi-level cell (MLC) and triple-level cell (TLC) (2- and 3-bit per cell) technology for even greater density. The new 850 SSD Pro and EVO drives remain in the same 7mm, 2.5-in. aluminum case as their predecessors did. The capacities include 120GB, 250GB, 500GB, 1TB and 2TB models. The 850 Pro is designed for power users and client PCs that may need higher performance with up to 550MBps sequential read and 520MBps sequential write rates and up to 100,000 random I/Os per second (IOPS). The 850 EVO SSD has slightly lower performance with 540MBps and 520MBps sequential read/write rates and up to 90,000 random IOPS. Samsung's 850 EVO SSD in its packaging. The 2TB model of the 850 Pro will retail for $999.99 (Amazon price at press time: $859.98) and the 850 EVO will sell for $799.99 (Amazon price at press time: $599.70). The 1TB EVO SSD will retail for $399 (Amazon price at press time: $294.99); the 500GB for $179 (Amazon price at press time: $146.99); the 250GB for $99 (Amazon price at press time: $87.68) and the 120GB for $69 (Amazon price at press time: $66.19). The 1TB 850 Pro will retail for $499 (Amazon price at press time: $428); the 512GB model for $259 (Amazon price at press time: $220.99); the 256GB model for $144.99 (Amazon price at press time: $120.99) and the 128GB model for $99 (Amazon price at press time: $92.99). As with previous SSDs, both SSD models come native with full AES 256-bit full disk encryption capability. The SSDs are made up of 128 individual 32-layer 16GB 3D V-NAND flash chips, along with an upgraded high-performance MHX controller, and four 20 nanometer (nm) size process 4Gb LPDDR3 DRAM chips. While Intel, Micron and other flash makers have rolled out their own versions of 3D NAND, Samsung was the first to begin mass producing it in 2013. Along with far greater density, the 3D NAND technology provides two to 10 times higher reliability and twice the write performance over planar (2D) flash memory, according to Samsung. 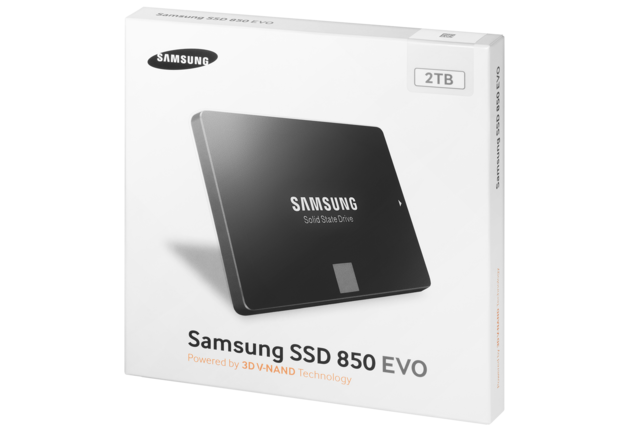 Samsung guarantees the 2TB 850 Pro for 10 years or 300 terabytes written (TBW), and the 2TB 850 EVO for five years or 150 TBW. Computerworld reviewed the Samsung 850 Pro last year and found it to be fast and inexpensive. Un-Soo Kim, Samsung's senior vice president of branded product marketing, said the company has experienced a surge in demand for 500GB and higher capacity SSDs with the introduction of V-NAND flash memory. 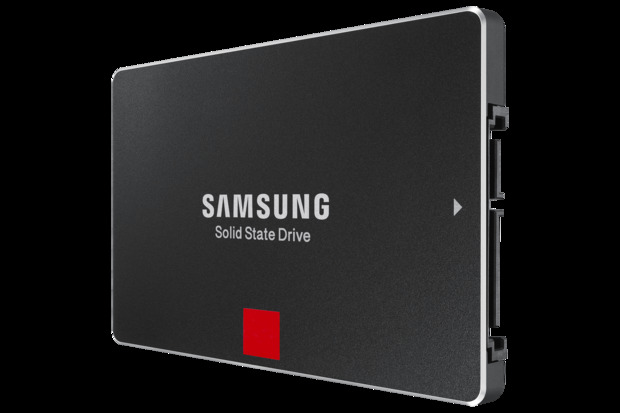 "The release of the 2TB SSD is a strong driver into the era of multi-terabyte SSD solutions," Kim said.